In a meditation retreat, we come to enjoy meditation and to explore a meditation practice. But why would we want to enjoy meditation and have a chance to explore a meditation practice? Because we need support. We need help. In a meditation retreat, there is healthy food and a lot of free time and space. There is time to rest, time to be still, time to balance, time to breathe fresh air, and time to harmonize sleep cycles. But what happens when we leave the retreat? What happens when we leave the yoga class, healing session, or wellness workshop? After we leave, we probably won’t continue to have healthy food prepared for us, at optimal times, with mindfulness and love. Gone is the space to balance, sleep, be still, or breathe fresh air. We can’t depend on outer conditions to keep us healthy, happy, and in harmony. More severely, we cannot depend on outer conditions for mental clarity and inner peace. How do we get unwavering peace of mind regardless of the circumstances? We can take meditation home from the retreat. We can take meditation anywhere, and it doesn’t need to be in a classical or rigid format. In the end, meditation is unwavering peace of mind, regardless of the circumstances. Meditation has such a broad understanding, we could almost liken it to the term “exercise.” Exercise can be used keep the body healthy, the systems harmonious, the blood circulating, the lungs expelling. Maybe we want to be beautiful, healthy, or fit. Exercise could be used for competitive reasons or to accumulate self-worth. Or, perhaps it could be used to cure an illness or give relief from a disease. Exercise can be used to support pain management. Usually, exercise refers to making the physical body healthy. Similarly, meditation serves many agendas. And, it can be defined by what its intended out outcome is. Why we are doing meditation defines what meditation is, more or less. There are too many effects to list here. They range from gross to subtle, from releasing toxins and stress in the nervous system and disease in the physical body, to relieving stress and disease in the mind. Meditation makes the mind sharp, clear, and creative. Meditation refines our consciousness to be non-reactive and non-judgmental (accepting and in flow). Researchers speak of “flow states,” in which human beings can enter a superior way of cognitive and physical functioning by submitting themselves to a high state of consciousness where they are no longer the “doers.” This is closer to the ancient use of meditation—a way of revealing the truth of our being, what we really are. Because, beyond a fluctuating set of thoughts and beliefs, or body, what are we? Realizing the truth beyond an abstract philosophy has been the ultimate goal of meditation across the ages. Generally, meditation refers to making the mind, emotions, and consciousness healthy. Exercise, while its more profound use is to keep the human being healthy, happy, energized, and balanced, it could be used for more superficial reasons like competition, image, or ego-power. Although meditation could similarly be used for more mundane reasons like clearing the busy mind or calming agitated systems, its more profound use is to enable us to recognize the absolute freedom that is ever-present within. This freedom and peace of what we really are is somehow deeply obscured by conditioning, personal desires, and limiting beliefs. In the end, meditation is about an expansion and about letting go. There are two main obstacles to meditation (according to me). The first is discomfort in the physical body, the second is discomfort in the mind. Discomfort in the body: There is a long story here. But in short, we can ask ourselves why the body is uncomfortable, what it would take to sit comfortably, and then do it. There are short- and long-term approaches here. We should do both. We can ask our yoga and meditation teacher and our friends for advice. We can take the responsibility for our own comfort and develop the capacity to sit for longer periods of time. Meditation Tips: USE A CHAIR. Props, cushions, and blankets help us slowly become more adept at sitting. We can also do warm-up exercises for the troublesome places before we sit. Discomfort in the mind: I believe the discomfort in the mind comes from one main misunderstanding—that there are two OPPOSITE practices that are confused for meditation. And merely our ignorance about what we are meant to be doing makes the meditation session difficult. Concentration is a contraction of our energies, focusing on one thing. Clenching the reigns of our mind power and bringing it back, again, and again, and again, and again whenever the thoughts wander. Thoughts of lunch, and we bring it back. Thoughts of a conversation, of the future, of anything other than this very moment—we calmly and lovingly bring the mind back. Concentration takes effort, and we only have a finite amount of energy to concentrate with before we need a break. It is good to spend as much time concentrating as we possibly can, but we can’t expect our efforts to exceed our abilities and our energy. Eventually, we’ll have to let go of the concentration practice. It is hard while we are doing it, and a relief when we stop. Like weight lifting! It’s a skill that needs to be built up. Meditation, however, is the opposite of concentration. Meditation is a relaxation and a release of all effort. 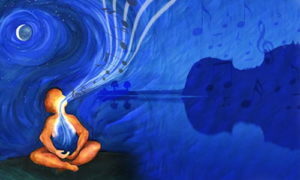 While concentrating is a concerted effort towards one thing, meditation is a letting go of all things. Softening, opening. When the contraction of the mind returns moment after moment, we let go—most of the time into an “object of meditation,” something that expands and softens us. Like the Heart! There is only one thing that’s difficult—resisting what is. The only way to resist what is is to think about what is. Meditation is about letting go. Meditation is two things: relaxation and freedom. This is our mantra: relaxation and freedom. When tension or thoughts or problems arise, we simply recall: relaxation and freedom. Here’s how to do each one. Relaxation is breathing, which softens the body. We scan the body parts and let them go. We scan the emotions, breathing into them and letting them go. We step into being the witness of the thoughts… breathing, relaxing, and letting them go. I can share one thing that makes it a lot easier to let go of thoughts, but it works a lot better when we realize it for ourselves: None of our thoughts are true. Truth, by definition, is something that does change. Our thoughts are not true. Our thoughts are subjective, personal, likely to change, and, often, psychotic or otherwise not beneficial. I promise with all my heart, we can let them go. When we do, we deeply relax. What about freedom? 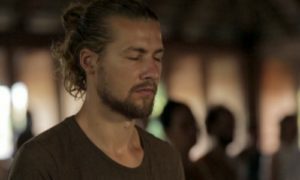 How to we “do” freedom as a technique for meditation? Freedom, here, is the freedom from the need to think about anything, to hold on to stress, or to feel past experiences or traumas in the body. The quickest, best, and most transformative way to practice freedom? Coming back to the Heart. We simply drop our entire consciousness into the space of the Heart. In Hridaya Yoga, we speak about the heart not only as a physiological organ, but also as the very source of love, connection, truth, bliss, and freedom. The more we open to the truth of the Heart, the more the mind is purified and the more easily we can let go of thoughts and relax into who we really are. We can all try it. If we have 5 seconds, 5 minutes, or 5 years, we can watch our lives drastically transform from coming back to the Heart.